You will be picked by our representative to the hotel for dinner and overnight stay at Malakai Eco lodge (mid-range), Nexus Resort( budget)La Petit Village (luxury)DAY 2: Jinja to the Nile. After your breakfast in the morning, you will be picked by a guide to Jinja. Visit Ssezibwa falls en route and enjoy the sights and sounds. Proceed to Mabira forest for a short nature walk. Lunch en route in Jinja town. Then you will head to the source of the Nile River. Transfer back to Kampala. Dinner and overnight stay at either Malakai Eco lodge (miid-range), Nexus Resort( budget)La Petit Village (luxury)DAY 3: Cultural tour. Breakfast and depart for the Kabaka’s lake expecting to see various bird species. Proceed to Kasubi Tombs, the royal Burial grounds for the Kings of Buganda. Go to Bahai temple where those with the Bahai faith go for worship. Lunch in Kampala and visit the Namugongo Uganda Martyrs shrine where 22 martyrs were burnt by the old Kabaka (King) of Buganda. In the evening, go to Ndere centre and enjoy the different African cultural performances. Dinner and Overnight stay at either Malakai Eco lodge (miid-range), Nexus Resort( budget)La Petit Village (luxury)DAY 4: Kampala to Murchison falls national park. DAY 5: Game drive and Boat cruise. DAY 6: Transfer to Kasese. Early breakfast and drive to Rwenzori Mountain National park via the Albertine escarpment of the western rift valley through the green vegetations and traditional homesteads. Lunch enroute and proceed for dinner and overnight stay at Malafik(mid-range) / Hotel Margarita(budget)/. DAY 7: Hiking from Nyakalengija(1615m) to Nyabitaba Hut(2651m). DAY 8: Hiking from Nyabitaba (2651m) to John Matte Hut (3505m). DAY 9: Hiking from John Matte (3505m) to Bujuku Hut (3962m). DAY 10: Bujuku (3962) to Kitandara Hut (4541m). DAY 11: Transfer to Bwindi National Park. After breakfast, you will be picked by your guide again who will transfer to Bwindi Impenetrable forest National Park and stop at Ishasha Wilderness Camp for lunch. Have a remarkable sight of the tree-climbing lions. Visit the Ishasha River and see the Hippos, buffaloes, Uganda kob, topis, bushbucks and the vegetation. Proceed with the journey to Bwindi. Dinner and overnight stay at Bakiga Lodge (mid-range), Gorilla Mist Camp/Gorilla Safari Lodge/Chameleon Hill Lodge(luxury). DAY 12:Gorilla tracking and Nature walk. Have breakfast and head to the park headquarters with packed lunch to be briefed about the dos and don’ts while with the gorillas. Proceed to the forest. Nature walk in the Batwa (Pygmies) community and visit the Batwa people who have amazing cultural performances, traditional. Dinner and overnight stay at either Bakiga Lodge (mid-range), Gorilla Mist Camp/Gorilla Safari Lodge/Chameleon Hill Lodge(luxury). 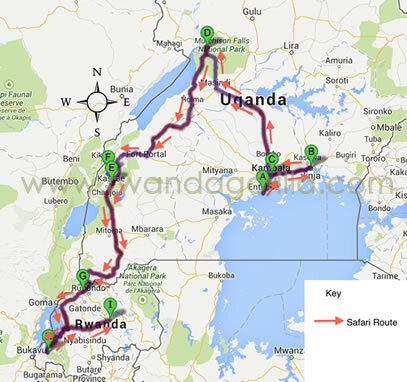 DAY 13: Cross to Rwanda. DAY 14: Dian Fossey Tombs. Enjoy your breakfast and head to Karisoke research centre to visit Dian Fossey’s grave. Dinner and overnight stay at Gisakura Guest House(budget) / Nyungwe safari lodge(luxury)Nyungwe Top View Lodge(deluxe). DAY 15: Transfer to Nyungwe forest. Have breakfast and drive southwards to Nyungwe forest. Lunch and visit to Mirambi genocide memorial site and Royal palace en route. Proceed for dinner and overnight stay at Gisakura Guest House(budget) / Nyungwe safari lodge(luxury)Nyungwe Top View Lodge(deluxe). Take breakfast and head to the park headquarters to be briefed about the chimpanzees. Proceed to the forest for the adventurous activity. Dinner and overnight stay at Gisakura Guest House(budget) / Nyungwe safari lodge(luxury)Nyungwe Top View Lodge(deluxe). DAY 17: City tour and Departure. After your breakfast in the morning, you will drive to back to Kigali for a city tour and later to the airport for your scheduled flight back home.